Many many years ago, there lived a very old woman and a very old man in a small old house. Both the old woman and old man couldn’t have any children. So the old woman came up with an idea of making a gingerbread man. The old woman put the flour into a bowl. Then she adds one cup of sugar, ginger, butter, one egg and water into it. The old woman rolled out the dough. The old woman used the cookie cutter to cut out a gingerbread boy from the dough. The old woman also adds the eye, mouth, button and bow ties to the gingerbread man. Finally, the old woman put the gingerbread man on the oven tray to bake it. Then the old woman waited patiently for the gingerbread man to be cooked. A few hours later, the gingerbread man was cooked, and the old women went to open the oven door. The old man and the old woman were very angry that their gingerbread man cookie ran away that they ran as fast as they can to catch him. The old man and old woman chased after the gingerbread man with all their speed, but cannot overtake the gingerbread man and eats him. The gingerbread man ran as fast as he could. On the way, the gingerbread man met a cow. The cow says, “Moo! Moo! You look like you taste so yummy for my tummy.” And the cow began to run after the gingerbread man and chased it. The cow ran and ran until he gets very tired, but was not able to overtake the gingerbread man and eats him. A while later, the gingerbread man met a horse. The horse chased after the gingerbread man with all his speed, but didn’t overtake the gingerbread man and eats him. 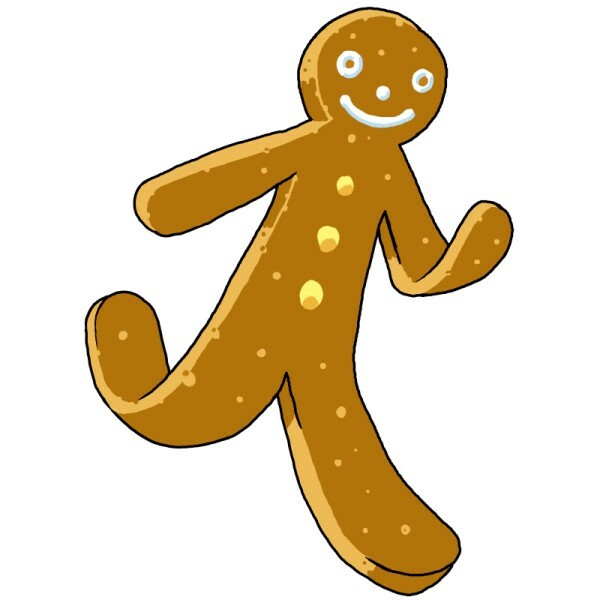 The gingerbread man laughed and sings the song as he run. As the gingerbread man runs, he met a chicken. The chicken ran after the gingerbread man as fast as he could, but never manage to overtake the gingerbread man and eats him. The gingerbread man felt very proud because non one can run fast enough to catch him. As the gingerbread man runs, he met a cunning fox. “I look very delicious but I will never let you catch me. The cunning fox pretended he didn’t care about the gingerbread man. Ahead of the gingerbread man is a river and the gingerbread man couldn’t cross it because the water will drown him. The gingerbread man jumped on to the back of the cunning fox. Then the cunning fox start to cross the river. When the water in the river is higher, the cunning fox says to the gingerbread man, “The water is too high. Please jump onto my head.” The gingerbread man listens to the cunning fox and he jumps onto the its head. The gingerbread man listens to the cunning fox and he jumps onto the its nose. As soon as the fox reach the dry ground on the other side of the river, the cunning fox flung the gingerbread man into the air. Then he snapped the gingerbread man up in his mouth and swallowed him into his stomach.